The American Woodcock, a rotund little shorebird that rarely sees the shore, is known to some as "Timberdoodle" or even "Bogsucker." How can you not love him. Especially when you experience his courtship dance. 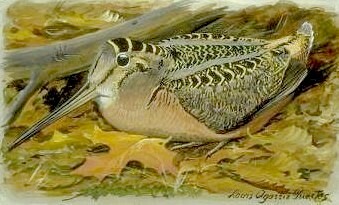 The woodcock is a forest bird and spends the day in the woods where his cryptic coloring blends into the leaf litter. 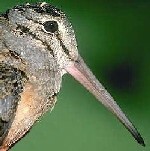 Its eyes sit so far back on its head that a woodcock can see all around, including behind itself. Its long, slender bill has nerves out to the tip to help locate earthworms below the soil. A woodcock can open its beak just at the tip while it is probing deep in soft soil. On spring evenings, he comes out into the open to do his spectacular sky dance. Look for him in clearings: meadows, bogs, power line cuts. He needs the open sky to perform. He is one of the earliest migrants to arrive in Massachusetts, often coming as early as the end of February. Arrive on his dancing grounds just after sunset and wait for the signal that he is there. "Peent" he states, hidden from view. "Peent." You will hear the sound varying, sounding close, then far. This is because he is circling, broadcasting his call in every direction. The peenting goes on for a while, then he launches into his sky dance. Silently he takes off, sloping up gradually, and as he gains height he begins his twittering sound. More and more frantic it becomes as he circles overhead, 100 meters in the air. Toward the end, the twittering is joined by loud vocal chirping, and the woodcock starts his descent. Abruptly it stops, and he coasts silently back to his peenting location. This is a good time to try to find out where he is calling from, so as soon as the chirping stops, look just above the horizon to look for him sloping in for a landing. What makes the twittering sound? 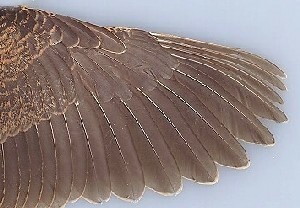 Look at the thin first three primary feathers on the wing. As the air passes between these feathers, it produces the twittering. The final chirping at the end of the display flight is produced vocally. Places I like to look for woodcock include Northeastern Burlington Campus, Dunback Meadow, and Arlington's Great Meadows. There is magic in experiencing the woodcock dance, and it is a ritual of spring not just for the woodcock, but for the birders who go to enjoy it.